All aboard! 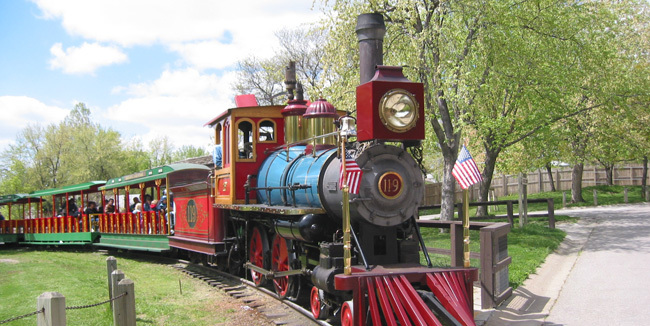 Take a ride on the Omaha Zoo Railroad. Guests can board the train at the Omaha Depot, located near Stingray Beach and Sue's Wildlife Carousel, or at the African Lodge, located on the southeast corner of the Zoo. 10 a.m. - 4 p.m.: April 19 - 21; April 26 - May 9 on Fridays, Saturdays and Sundays; Open daily starting May 10. In October, hours are 11 a.m. - 4 p.m. Hours are weather-permitting. All rides will not operate if there is rain, snow, ice or if the temperature will not reach 50 degrees by 1 p.m. Ask Guest Services about our rides and attractions packages upon arrival.